In this 5 minute masterclass, we’re going talk about the infamous Coltrane Changes. Coltrane changes, also known as the ‘Major Third Tonic relationship’ is a harmonic movement where instead of one tonic center, we have 3, which divide the octave into 3 equal parts, for example in the key of C, the other tonic centres would Ab, and E.
The ‘Major Third Tonic relationship’ can also be found in classical music, but in this masterclass, we’re just going to focus on jazz repertoire. Examples Before Coltrane – "Have You Met Miss Jones"
The ‘Major Third Tonic’ chord progression was used before Coltrane. For example, this exact progression can be found in the Rodgers and Hart song "Have You Met Miss Jones" which may have been an inspiration for Coltrane and others who wrote music using the Major third relationship. The tune "Giant Steps" can found on Coltrane’s album by the same name. The whole Giant Steps Album is definitely worth checking out. The tune "Giant Steps" is probably the most well-known song composed around the ‘Major Third Tonic’ Relationship. The tonal centers are B, G, and Eb. The song moves faster through the changes in the first 8 bars and slower in the next 8. 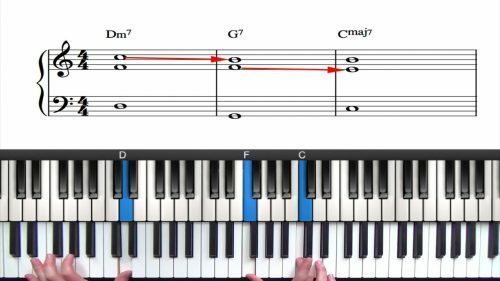 Even if Giant Steps is very hard to improvise over, the harmonic structure is seemingly simple; It’s just dominants leading to the tonics. Coltrane’s composition "Countdown" is another tune which incorporates the Major Third Tonic Relationship. Again this record first appeared on Coltrane’s iconic album "Giant Steps". 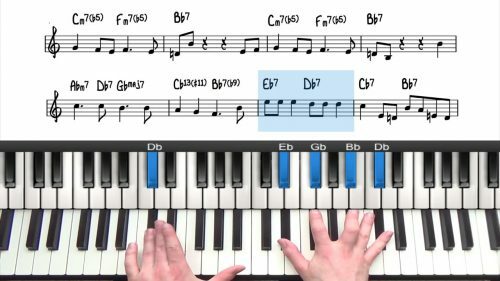 "Countdown" is based on Eddie Vinson composition "Tune Up" which we covered in the course on "Jazz Piano Foundations" – check out the related lesson section below for more information. As we demonstrate, Coltrane took 4 bar long 251 progressions, and reharmonizes it by adding in the other Tonal centers, then approaching them with their related dominant V7 chords. This lesson provides an introduction to reading lead sheets. 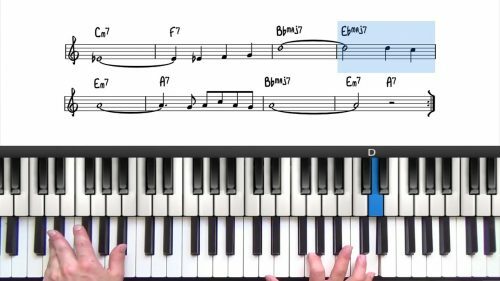 Unlike traditional piano music, lead sheets just contain one stave of music and chord symbols above. To improve your understanding of Coltrane Changes, go and listen of course the album "Giant Steps"
Also, check out the album "Coltrane Sound" where he uses the reharmonization over several different songs. "26-2" is based on "Confirmation", and "Satellite" is based on "How High the Moon" - just two name two. At the end of this lesson, we demonstrate how to apply the Coltrane Changes to a 251 Progression in F.
As an exercise, pick any 251 and work out the Coltrane Changes based on the Major Third Tonic Relationship. Take this around all 12 keys to familiarise yourself with this fascinating reharmonisation.